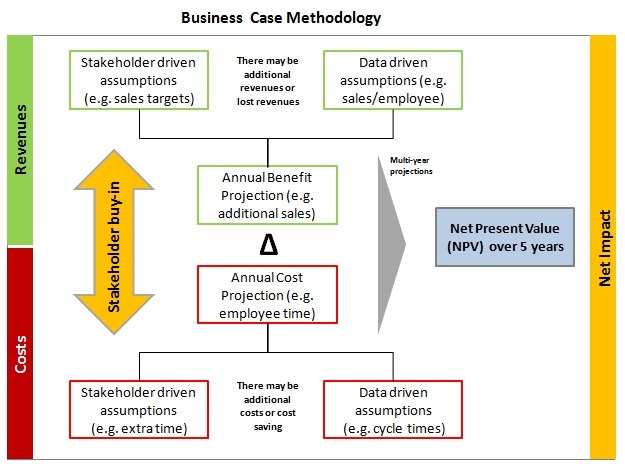 Business Case – Business Case Analysis – Business Case Methodology – Business cases are prepared to help a company decide whether to proceed with a given project. To start off the preparation of the business case requires understanding of the key metrics or key drivers that help company either generate or spend money. The money can be generated by increasing revenues or sales and/or decreasing costs. The key revenue driver is increased sales, for example due to an increased number of sales agents. Decreased costs may be as a result of increased capacity in the back office, because some of the processes that used to be manual are now automated. The more data used for the assumptions the better. Another way to validate assumptions is to obtain the key stakeholder opinion or buy-in. Business Case - this diagram visually depicts one of the common business frameworks, used by leaders to develop company strategy, tactics, models and approaches in an effort to enhance operations, marketing, develop new products and improve company competitive position.. This entry was posted in Finance and tagged business case, business case analysis, business case approach, business case assumptions, business case chart, business case diagram, business case example, business case explained, business case methodology, business case sample, develop business case, how to prepare a business case, what is business case by admin. Bookmark the permalink.